Nitsan's other reviews — NITSAN SIMANTOV. PHOTOGRAPHER. FILMMAKER. 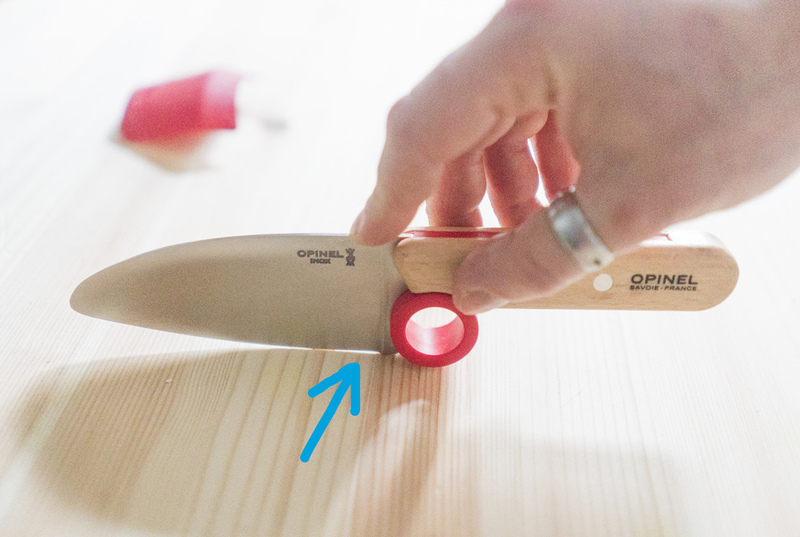 Detailed review: Opinel's safety-oriented kitchen knife "Le Petit Chef"
This is a small chef's knife designed with safety in mind. I love the unique style, safety-oriented design and compactness of this knife. I plan to have kids someday so it will be good for them too. Here it is on Amazon. At £27 it's very well priced considering it's a brand-name knife made in France. Opinel is a reputable knife manufacturer that has been around since 1890. 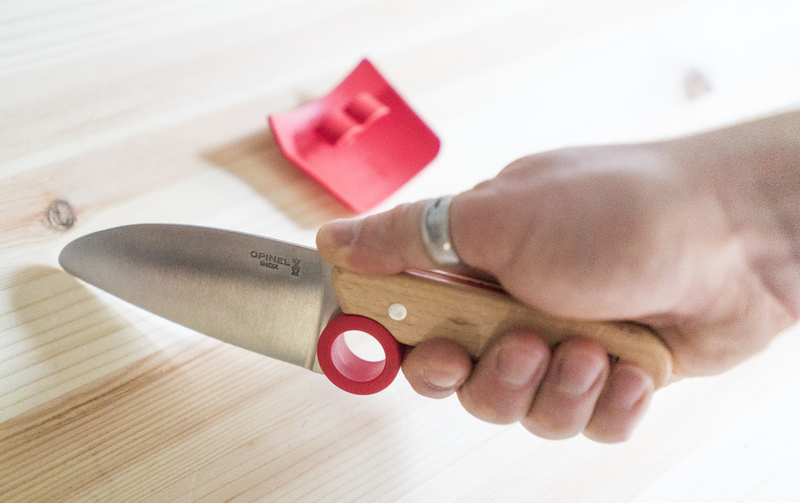 The ring on the knife is exactly 18mm inside, fine for kids and women, and large enough for some men, but men with big fingers will have to hold it in a different way, with the index finger over the top part of the knife, which is actually perfectly comfortable. For adults this ring is not necessary and just makes the knife slightly less comfortable to hold, but I guess for kids I can see this feature being somewhat useful. A good alternative would have been a half-ring, or a removable ring. There's a chance I'll cut half the ring off, because for my uses it doesn't add any safety. In the photos of this review I'll show the various ways it can be held. It definitely feels safer to use the knife together with this, even for someone experienced. It took me about a minute to get used to the finger guard. In my opinion if held correctly there's almost no chance of accidentally cutting yourself without actually trying to. If not held correctly, for example only clipping the guard over one finger, then some of your fingers are able to accidentally go under the guard if you don't pay attention. This doesn't hold onto my fingers very well because the clip can only go over the tips of my fingers (index and middle fingers), so I have to also use my thumb to hold it sometimes, which actually works fine. The tip at the top of the blade is not pointy, as you can see in the photos, but you can still slice downwards with the tip, perfect mix of safety and usability. The handle has some small imperfections. You can tell it's mass produced and not the work of an expert knife maker, but it's fine. As you can see in the product photos there are some gaps between the different materials, which over time will collect dirt. Personally I will be filling the gaps with moldable plastic called Plastimorph/Multimorph, which is affordable and very easy to use, you just warm it in hot water and then mold it with your hands as needed, as soon as it's cool it's a solid durable plastic. You can get a big pack on Amazon for £8. If you do this then you can't soak the knife in hot water when washing, as it will soften up the Multimorph again, but quick washes in hot water should be fine. The blade is beautiful and shiny. It's sharp, but not as sharp as is possible. It's a flat grind (tapering all the way from the top to the bottom) but does have an almost invisible secondary edge, which is good, otherwise it would be too sharp and very prone to damage. It's 1.7mm at the top of the blade and 0.3mm right before the secondary grind. Under a 40x microscope there are visible grinding scratches on the blade's cutting edge, which is better for slicing both hard and soft foods than a perfectly smooth cutting edge. This is also easy to replicate with cheap home sharpeners when you need to sharpen the blade. The blade has a Japanese "santoku" shape, which means the cutting edge is curved only a tiny bit, and the top of the blade has a big curve downwards. I really like it, and I read that this shape is popular with professional chefs. The area of the blade closest to the handle does not quite touch down to the chopping board surface due to the slightly raised bolster (the blunt thick metal area right between the blade and handle), which might just be a manufacturing mistake with my unit. For me it's not a problem as I can easily file the bolster down a tiny bit, although if you do that you must clamp the knife down in a safe way so you don't cut yourself, and in a way where there's no chance of accidentally running the file over the blade itself, which would ruin your knife. It's a good size for kids, but perfectly fine for an adult too. I actually prefer this size over a big kitchen knife. Approx 4" blade and 8" total. Due to the thin blade and plastic/wood handle the weight is only about 70g, which is very lightweight. It would be nice if this came with something to clip over the blade for when it's not in use. I may end up making one out of the Multimorph stuff I mentioned above. To be fair, I've never seen a kitchen knife that does come with one, normally they are just made for outdoors knives. I'm very happy with this for the price, even though I have to do a few fixes to bring it up to my standards (filling the gaps in the handle and filing down the bolster). If you found this review helpful you can support this blog by purchasing yours from this Amazon link. Depending on the person using it, something that might be even safer is a slightly serrated blunt-ish knife. In my experience there is an amount of sharpness on a slightly serrated blade that will cut vegetables nicely but won't accidentally cut into a finger. I'm not only talking about "sawing" through the food, at the correct sharpness they will press-cut most vegetables just fine, and will go through tougher foods easily using a slight slicing/sawing motion. I will have to demonstrate this in a video at some point. Here is a photo of two lightweight knives which I've had for years, both of which do this perfectly, one with very large serrations, one with very small ones. I can press them hard into my hand and they won't cut me. As far as I know you can't buy knives like this, you have to buy a sharp knife and dull it down, and of course either buy one with a rounded tip or cut/file the tip off. In my opinion if done right these are much more "idiot-proof" than the Opinel with its fancy finger guards, but as you can see they aren't very pretty, and they won't chop small stuff like parsley, although they will slice through it just fine with a slicing motion. A very decent product, as you'd expect from Makita, and as usual with Makita you get reliability rather than bells and whistles. This is my replacement for the terrible Tacwise Duo 35 that fell to pieces in 15 minutes. - Very solid, feels reliable, and Makita's reputation says it probably will last for ages. - The safety double-trigger thing on it is nicer to use than the kind of safety latch found on most other staplers, which gets pressed against the material/workpiece. - Easy to use with one hand without worrying that the staples won't go in all the way. - I registered it with Makita for the 3 year warranty, which you can only do within 30 days of buying it! - Easy to load staples. - Under normal use I don't think it will jam at all. - Pretty loud. Although not quite as loud as the Tacwise was. More comfortable to use with ear protection. Rated at 73dB, and that's what I measured it at too. - No LED light. I attached a NiteCore rechargeable keyring torch onto it with a releasable zip tie. See photo below. - Won't fully go into some harder materials like some knots in the wood or certain types of extra hard MDF board. But does not ruin the staple if it's half way in, so you can finish the job with a hammer. Not ideal but works fine as long as you don't have to work with those hard materials all the time, which I don't. I like to work with real wood as much as possible. - Won't work with my Tacwise 10mm x 10mm stainless steel staples. The opening is too thin, so even though they sit perfectly in the staple slot, no staples can fire out. Surprisingly you can slightly pull back the staple slide on it and then it will fire normal ones, but I have no idea if this is safe or will cause damage to the tool or workpiece. You can find 5000 Makita brand staples for about £14 on Amazon. - Can't use any pins or nails. - Strange curved grip that means it wants to aim slightly downwards when you try to point the tool forwards (when working with materials on a wall, etc). Not a big issue but definitely noticeable. - No power adjustment, but it seems to do a good job as it is. I added an LED light using a NiteCore rechargeable torch and a releasable zip tie. - The 18v version will shoot up to 22mm staples, as will the 14.4v DST220Z version. - Bosch have a little green cordless 10mm one for £41 or so. Ruins the staples if you try to go through hard materials like MDF, and is said to break down after a few thousand staples, which is why I chose this Makita. I used to average 4000 staples a year with a £15 manual stapler, now with an electric one I could probably use that much in a month. In my opinion it's a bit too expensive, but it seems that most similar tools are expensive (nailers, etc.) so maybe there's a good reason for it. I only bought it because I got it for £85 from FFX, plus £20 for a cheap non-brand battery and £20 for a cheap non-brand charger. My serial number says it was made in 2008. Wow. I guess absolutely no one is buying these things which explains why the price was reduced so much. I'm also pretty sure this is the only review online about this product at the time of writing. Not because it's a bad product, but because most people who use Makita are tradesmen working with the 18v system, and maybe also because of the high cost of a genuine Makita 14.4va battery compared to the 18v ones. A seat I made for my exercise bike, using scrap wood, scrap pieces of foam, suede from an old jacket and about 300 staples. I used the Makita stapler, a Lansky World Legal knife and a SOG S44 Pocket PowerPlier. The base was made from some scrap wood I had, mostly using a Bosch GSB 18v-Li drill-driver and GST 18V-Li jigsaw. Note: This stapler is also called the BST110RFE and BST110Z, depending on the package you buy it in. Smooth and decently quiet. At slow speeds it's about as quiet as my tiny 3.6v screwdriver. Nice speed control on the trigger. Lots of power. I've yet to come across anything this couldn't drill or screw. The LED light works well. You can press the trigger just a tiny bit to turn the light on without having the drill actually spin. Great for when you're aligning the screw. Very compact for this power. Because of this, there is no second handle. Not a problem, but would have been nice to have. Bosch do a larger version with a second handle, but it costs more too, so I went with this. Both batteries have a test button to see how much is left, although on one of them it's a bit hard to press the button. Really tough. See thee video made by "tools in action" on Youtube. They did a great destruction test with lots of 18v drills. There are also several other destruction tests with the Bosch drills on Youtube. Charger seems tough too. Charges very quickly. I use the carry case for all my in-use chargers. This is not the L-Boxx version, which costs a little more and has the option to stack multiple boxes securely. Who was the genius that designed the shallow belt clip? Almost guaranteed to fall off your belt in a few minutes. I'll be making my own deeper belt clip for this, probably using some strong steel wire. An extra 1-3cm depth would do the trick I think. I've had a screwdriver bit fall out a few times when I didn't tighten the chuck well enough. While this is great, many budget drills are also very good for the price you pay. This is definitely the best drill I've ever owned, but a cheap drill can often do the same job for a fraction of the cost. I would say if you're on a low budget, spend £20 on a basic drill until you have the budget for a £130 kit. I personally wouldn't go for the mid-priced ones at £50-70, at that price I would just spend a bit extra and get Bosch or Makita to get the reliability. I got a Bosch 18v drill and jigsaw, even though the Bosch range has a few things missing (and some tools that have no warranty because they are only available from abroad, such as the 18v sander, 18v vacuum cleaner, etc.) so I might have to get a couple of Makita 14.4v batteries to give me access to a good cordless staple gun, pin nailer, sander, vacuum cleaner, etc. The Makita 18v line is noticeably more expensive than the Bosch 18v, so for me it works out fine to have a mix of Bosch 18v and Makita 14.4v. Very glad I got this. Using it almost daily. Love it. I'm very pleased with this purchase. Feels like it's worth every penny. I've used it on almost every project I've done since I bought this tool. I can't believe I've waited so many years to invest in a quality jigsaw. The speed control on it is lovely. It can go SUPER slow, and very gradually increase speed as you press the trigger harder. Superb for getting really good control when cutting some materials. It chomps through wood fairly fast, even when used at slower speeds, although most other jigsaws do too. No uncomfortable vibrations coming from the tool in my opinion. In comparison, I really don't like using most sanders and multi-cutters due to the vibrations. Once again, not a big issue with most jigsaws as far as I know. The blower seems to work well. The harder you press the trigger, the more air it blows. There is a place to connect a dust extractor, but the tube attachment is not included. I've had no issues getting smooth cuts when needed. Obviously when you go really fast then you get a rougher cut with more splinters. A clear splinter guard is included too, but I've never used it. It's not the easiest thing to clip in place. I find the grip very comfortable. Actually I love holding and using this. Feels superb in the hand. The build quality feels very good overall. It's very smooth and quiet, although obviously when used at higher speeds it does make a bit more noise. Really not bad though. This was an upgrade to a nasty quality cheapo jigsaw that was uncomfortably loud and overall pretty terrible. I was amazed that I can cut soft woods so quietly that I can do it at night without bothering my neighbors, especially with a rough cut blade. - As long as I keep the speed not too fast and use a sharp blade. Using the pendulum/osculation setting helps too. For most harder materials the blade friction would make a bit more noise though. Battery life on it is exactly what I would expect, very good. I'm using 2Ah batteries for this and my GSB 18V-Li drill-driver. I might get some 4Ah at some point, but for now I really don't feel the need. Swapping blades is effortless and takes about two seconds. It came with three blades. I ordered extra blades of course. There's a very nice selection of blades made by Bosch, and they are very reasonably priced for the quality you get. Apparently Bosch also manufacture the blades for many of the "competitors". I also got some blades from Dekton and Eclipse, which are both brands that make decent lower budget tools, but I've not had time to fully test them. I'm enjoying the Bosch blades too much, especially the big rough-cut silver one that was included with the jigsaw. The trigger can be locked in the OFF position for safety, but there is no trigger lock to allow you to cut without holding the trigger down, which I guess is another "safety" feature, but really it feels like Bosch are trying to force you to also buy their other 18v Jigsaw that just has a simple ON/OFF switch instead of a variable speed trigger. It's fairly easy to move the safety switch, which is a similar design to a forward/reverse switch on a drill. In my opinion that's not a good place, as it could get pushed fairly easily by accident. I definitely take my blades out after every use, which is a piece of cake with the quick blade release. No laser cutting guide. Missing from many other professional jigsaws too, but I'd love to have that option. A hex key must be used to change the angle of the cut. The tool is attached to the jigsaw, but is a bit hard to remove. Not ideal. I can't find a dust collection shield for it. It doesn't seem necessary, as there isn't a huge amount of dust thrown around by a jigsaw, but many other brands have a detachable clear dust guard/shield and it would be a nice addition when using a dust extractor. There is no switch to disable the blower or LED light, they always turn on when you cut. Not a big problem. No blade compartment built into the tool. I've not seen this on any other jigsaws, just seems like a good idea. Maybe a detachable one would be good. Obviously not a problem though. Not a big selection of accessories and cutting guides available for this. There are a few, but I'd love to see an awesome set of guides like Festool have. To be fair the Festool is around £400 with the accessories kit, not including a battery and charger. I love it. I have no regrets about spending extra to get such a high quality tool. I think it's actually fairly priced for what you get. Remember to register it with Bosch within 30 days. As far as I know you can't get the extended warranty after that.